Bheemana Amavasya, also known as Bhima Amavasi, is an important Hindu ritual performed by women in Karnataka. Bheemana Amavasi Vrata 2019 date is August 1. Bheemana Amavasya is observed on the no moon day (Amavas) in the Kannada month of Ashada (July – August). On the day women pray for the well being of their husbands and brothers. The ritual is also known as Deepasthambha Pooja. Jyoti Bheemeshwara Ammavasi (Bheemana Amavasi Vrata) is dedicated to Lord Shiva and Goddess Parvati. Married and unmarried women and girls on Bhima Amavasai pray for the long life of their husbands, brothers and other male members in the house. A pair of lamps made using mud known as Kalikamba represents Lord Shiva and Goddess Parvati on the day. Special pujas are done on the auspicious day to appease the divine couple. Thambittu Deepa or Thembittu lamp made from flour is made on the occasion and lit to cool all bad emotions like anger, frustration etc. Another important feature on Bheemana Amavasi is the making of Kadubu. Dough balls, or Kadubus, have coins hidden in them. Coins are also hidden in idli, kozhakattai, modak and wheat balls. These balls are smashed by brothers or young boys at the end of the Bheemana Puja. The ritual is based on the story of a young girl who was married to a dead prince. She accepted her faith and the day after marriage she performed the Bheemana Amavasya puja with mud lamps. 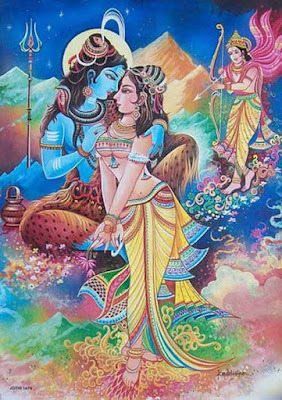 Impressed by her devotion Shiva and Parvati appeared before her and brought back the prince to life. The mud kadubu prepared by her was broken by Lord Shiva. No deep fried or shallow fried food is eaten on the day. Married women perform the Bheemana Amavasai ritual for nine years after marriage.